A graduate of the UC Berkeley School of Librarianship (1929-30), Carma Russell (Zimmerman) Leigh was library director in Watsonville (1932-38), Orange County (1938-42) and San Bernardino County (1942-45) before heading north to become Washington State Librarian in 1945. In Washington, she was instrumental in passing legislation to create regional systems—a concept that she brought back with her to California in 1951 when she was appointed as California State Librarian. She was also very active in ALA, during this period, traveling to Washington D.C. several times to lobby Congress for federal funding of public libraries. 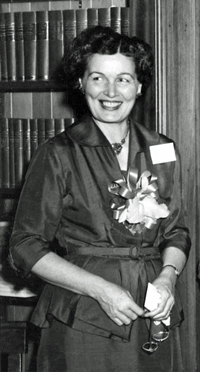 While Carma was California State Librarian (1951-72), the first California Library Commission was created, two statewide studies were conducted focusing on public library strengths and weaknesses, and a “Master Plan for Public Libraries in California” was approved. After years of lobbying and working closely with librarians throughout the state, the Public Library Development Act was finally passed in 1963, establishing regional library systems. Carma Leigh retired in 1972. Cindy Mediavilla, “Carma Russell (Zimmerman) Leigh—An Historical Look at a Woman of Vision and Influence,” Ph.D. dissertation, UCLA, 2000.